Clean-energy advocate is off and running after Monday sendoff. 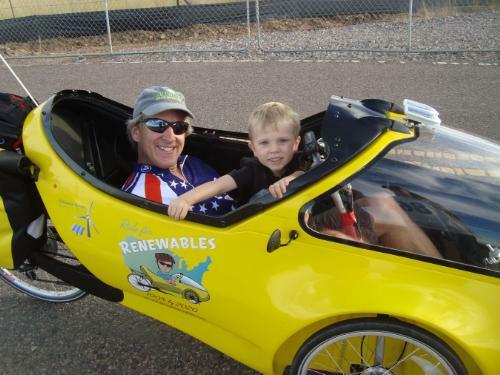 Green energy advocate Tom Weis is riding 2,500 miles from Colorado to Washington, DC on a human-powered, electric-assist “rocket trike,” calling for a national goal of a 100% U.S. renewable electricity grid by 2020. Weis, a feisty and outspoken clean-energy advocate, first came to Boulder Reporter’s attention last October with a fiery speech on the Day of Climate Action. See also his article, “Let’s get serious about renewable energy,” from Boulder Reporter in June. Over eight weeks, Weis plans to visit a dozen states to profile solar, wind, geothermal and efficiency solutions, as well as polluting energy problems like coal burning, nuclear power and mountaintop removal mining. A petition issuing the 100% by 2020 demand is posted at: www.ClimateCrisisSolutions.com. Ride backer Dr. James Walker, past president of the American Wind Energy Association and vice chair of enXco, Inc., agreed: “The wind industry needs to support a crash program to responsibly deploy as much wind power as humanly possible between now and 2020.” He cited the industry’s creation of 85,000 jobs in the last five years, as well as its cost competitiveness with coal, as reasons to favor wind over polluting energy sources. The principal sponsor of Weis’s sojourn is AllEarth Renewables, Inc.